One of the more interesting moments in Wednesday evening’s Higher Education Works Foundation forum in Charlotte was a question from a student leader in the audience about providing in-state tuition for students who are part of the Deferred Action for Childhood Arrivals program. 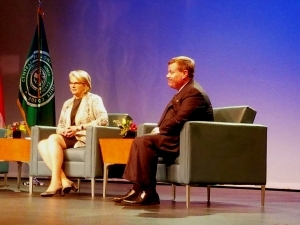 UNC System President Margaret Spellings and N.C. House Speaker Tim Moore taking questions at the Higher Education Works Foundation forum Wednesday night. Last month President Donald Trump announced an end to the program, which allows children brought to the United States without documentation to remain and work in the country. Some of the more than 800,000 children brought to the U.S. this way will be eligible for deportation beginning in March. The president has urged Congress for a legislative solution but with Republicans split between new legislation that accomplished much of what DACA did and hard line conservatives deriding that as “amnesty,” a way forward is anything but clear. Asked for their views on DACA and the making it easier for DACA-qualified students to attend North Carolina universities, UNC System President Margaret Spellings and N.C. House Leader Moore – both Republicans – seemed to come down on the side of DACA protections. Spellings said she has been outspoken on the issue since her time as Secretary of Education in the George W. Bush administration. Moore was more circumspect, but ended his answer with a word of support for the student DACA activist asking the question. “Certainly my heart is with you,” Moore told the student.